Feel the wind fill the sails. Climb high in the rigging to the first crow's nest. Relax in the bowsprit net. Life aboard a sailing ship appeals to adventurous travelers who are eager to explore unspoiled parts of the world in relative comfort. Leave conventional cruise formalities, such as dressing up for dinner or rigid timetables, to conventional cruise ships. Star Clippers' fleet of three (soon to be four) vessels -- the flagship Royal Clipper, Star Clipper and Star Flyer -- does just that, and with great panache, aboard some of the fastest and largest clipper ships ever built. The man at the helm of Star Clippers is Mikael Krafft, a Swedish entrepreneur who, at the age of 6, landed his first job at a shipyard near his home in the Stockholm archipelago. As a child, Krafft listened to the stories the old seamen told, and his love of sailing was born. When he was 12, he sailed his own 18-foot boat over 20 miles of open seas. Later, he practiced maritime law in Sweden and France. In 1986, Krafft relocated to Brussels, where he founded the White Star Group, involved with real estate development. 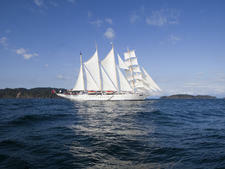 White Star Group is the parent company of White Star Clippers, which commissioned Star Flyer and Star Clipper. Krafft launched Star Flyer and Star Clipper in 1991 and 1992 in Belgium, and they were the first clipper ships since 1911 to be granted the certificate of highest quality by Lloyd's Register of Shipping. 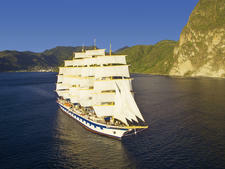 The even more ambitions Royal Clipper was launched in 2000 as the largest clipper ship built in a century. The new ship, under construction in Croatia and to be delivered late 2017, will be larger still, carrying 300 passengers. One of a handful of sailing ships -- with real sails -- Star Clipper holds just 170 passengers and offers a contemporary sailing experience. Royal Clipper is the world's largest full-rigged sailing ship; a five-masted beauty which is a throwback to another era. Star Flyer is getting on now -- dating from 1991 -- but the ship, with ots 226-feet high masts -- still draws admiring gasps from onlookers. 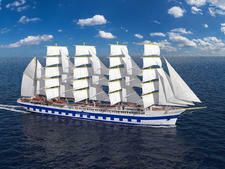 Monaco-based tall ship sailing specialist Star Clippers has started construction on a new vessel, Flying Clipper, which will be delivered in the first quarter of 2018. 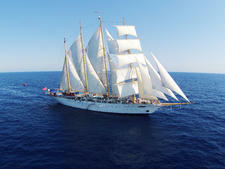 Star Clippers' three (soon to be four) tall ships are for people looking for a one-of-a-kind seafaring experience. Clear skies, blue seas and billowing white sails add up to a romantic fantasy voyage. There's a sense of adventure, too. Though itineraries are mapped out in advance, there are days on some cruises when the captain follows the whim of the wind so passengers can enjoy the full sailing experience. Those who want a true adventure can join the twice-yearly transatlantic crossings, when the ships reposition between the Mediterranean and Caribbean. New experiences are what the Star Clippers fleet is all about. Depending on the captain and the cruise director, informal classes in knot tying or celestial navigation might be on the daily program. The crew and passengers often star in the evening shows and games. Forget guest lecturers, nightclub-type floorshows, a casino, elevator or round-the-clock room service. Water sports are a major component of each cruise, with a from-the-ship program featuring complimentary snorkeling, kayaking, sailing and waterskiing. Diving trips and certification classes are also on offer, as are therapies in a small massage tent from the onboard Thai masseuse. Royal Clipper, the flagship, has a water sports platform in the stern for use when the ship is at anchor in a suitable spot, as well as a spa. Both of these are features that will be included on the new ship, too. Themed cruises take place several times a year across the fleet. In particular, topics include yoga and meditation, but others have included archaeologists and even a retired Star Clippers captain. The cabins offer yacht-type creature comforts. They're compact in design with lots of doors and drawers to keep everything in place when under sail. Soft furnishings and linens were replaced on all three ships between 2013 and 2015. Meals, except for dinner, are buffet style and feature an international mix of foods. Made-to-order eggs at breakfast start the day on a high. There's usually a pasta station or carving table for lunch, lots of salads and creamy desserts. Dinners are a la carte and served by waiters -- quite good, but not gourmet. The menus and food presentation are supervised by culinary advisor Jean-Marie Meulien, a top French chef with many Michelin stars to his name. In comparison to Windstar Cruises or Sea Cloud Cruises, Star Clippers nearest rivals, a Star Clippers cruise is a more casual voyage; it's more about the sailing than the facilities onboard. Although passengers are not required to sail the ship, this is nonetheless a sailing experience and is never sold as a "luxury cruise." The new ship, though, which will have 38 cabins with private balconies, may present more of a challenge to these high-end lines. In the Caribbean, about half the passengers are North Americans, and half are Europeans. In Europe, fellow passengers are primarily European: French, Italian, English and German. The Southeast Asian itineraries attract a higher proportion of Australian travelers. Passengers span a wide age range; you might be traveling with a group of 30-somethings and another group of 70-somethings. Many passengers are repeaters who own their own boats. Children over the age of 8 or so can have a grand time, but don't expect full-scale children's programs or youth counselors. Star Flyer (introduced in 1991) and sister ship Star Clipper (1992) claim to have the tallest masts in the world, towering 226 feet above the waterline. Each ship is 360 feet in length and has four masts and 16 sails that measure a total of 36,000 square feet. They carry 170 passengers. The 227-passenger Royal Clipper joined the fleet in 2000. It's 439 feet long with a beam of 43 feet. Its 42 sails boast an amazing 56,000 square feet of Dacron. The highest of its five masts is 197 feet. Of the three vessels, this one offers more of everything -- more sails, more cabin space and more services (for top-category cabins). Because Royal Clipper doesn't heel as far as the two smaller ships, it's the best bet for a first timer, as the ride is smoother. The new ship, modeled on the great square rigger France II, brings a new level of luxury to the line with 38 balcony cabins (including four owner's suites) out of 150 total, more deck space and a spectacular diving pool that will descend through two decks, with glass sides so that passengers below decks can see the divers. The vessel will have five masts and will be square-rigged (like Royal Clipper), with a function room, library, small spa, two pools in addition to the diving pool, a two-deck dining room and three bars. The ship will be 532 feet long with a beam of 60 feet and a sail area of 68,350 square feet.